Pinoy bowlers pose with their medals, and Malaysian bowling icon and 2018 Palembang Asian Games gold medallist Shalin Zulkifli and family, during their victory dinner. 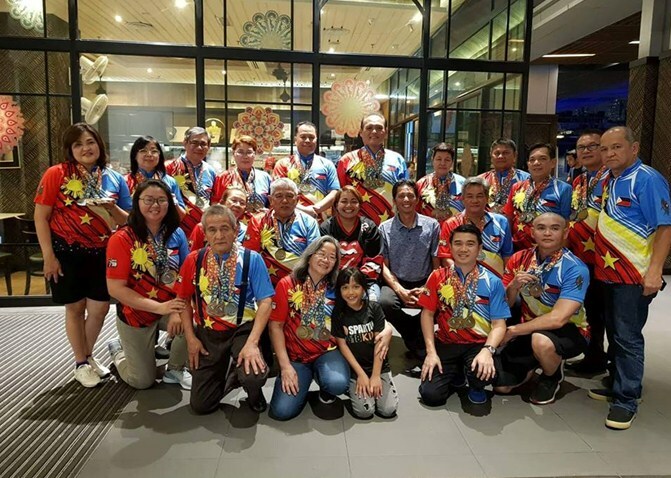 Represented here by the Philippine Bowling Congress, the Pinoy keglers finished their campaign with an additional 5 gold medals in the Masters event at the close of bowling competitions. An additional 7 gold medals escaped their grasp when organizers decided to no longer award medals in the All-Events. “We came here with very humble expectations to bring in just one medal, of whatever color. So to have raked in so many medals was really God-sent for us.” According to PBC president Engr. Guillermo Mallillin. For the first time ever, the Philippine delegation was composed of bowlers that represented Luzon, Visayas, and Mindanao – that truly reflected the country’s diversity. In an unprecedented run, the Philippine contingent won a medal in all divisions that they competed in. The 20 man delegation, culled from Davao, Iloilo, Cavite, Pampanga and Metro Manila, paid for their own expenses in participating in the Games. They also topped 7 divisions in the All-Events. However, medals were no longer awarded. Silver Medallists were from Francis De Leon (Men’s 50+), Absalon Serrano (Men’s 60+), Manuel Nierra (Men’s 65+), Crystal Chavez (Women’s 35+), Anne Marie Duya (Women’s 50+), Sol Bagalay (Women’s 60+). Singles Bronze medallists: Ben Pacheco (Men’s 70+), Perla Pacheco (Women’s 60+), and Tans Bernas (Men’s 65+). Doubles Gold Medallists: Francis De Leon & Louie Bianzon (Men’s 50+), Gerry Mallillin& George Mañozo (Men’s 60+), James Young & Gerald Samuels (Men’s 45+), Anne Marie Duya& Crystal Chavez (Women’s 45+), Emma Bañez& Sol Bagalay (Women’s 50+), Raquel Hayes & Baby Diosana (Women’s 55+), Perla Pacheco & N. Zainudin (Women’s 60+). Mixed Doubles Gold Medallists: Crystal Chavez & James Young (35+), Francis De Leon & Baby Diosana (50+), Al Langkuno& H. Han (60+). Mixed Doubles Silver Medallists: Perla Pacheco & Ben Pacheco (60+), Emma Bañez& Louie Bianzon (50+), Raquel Hayes & Joey Macatangay (55+). The inaugural Asia-Pacific Masters Games was participated in by 62 countries, with over 5,500 athletes competing for 22 sports disciplines. It is also recognized by the International Olympic Committee (IOC).